Ever since his childhood, Pete Ricepudding knew he had been born in the wrong body, but he didn't come out before his sixtieth. He wrote at once to Jerry Springer. Within a month he was standing on the stage for the talk show. "Welcome! ", said the host. "I think it's very courageous of you to tell us about your experiences. Ladies and gentlemen, give this young man a warm applause!" While Jerry and his audience kept clapping until their hands were hurting, Pete Ricepudding barked modestly. The presenter offered him a fine little piece of cheese. He waited till the audience stopped clapping, and looked at his guest with piercing eyes. "How did you discover you should have been a dog?" Pete Ricepudding blushed like a beetroot. He told his story with a stammering voice. He told as a toddler he felt inclined to wag some tail. He used to eat the biscuits of their pet dog Fido, and bring the newspaper from the letter box to his father. The show master expressed his approval, and chucked Pete under the chin. "When is the operation? ", he asked. 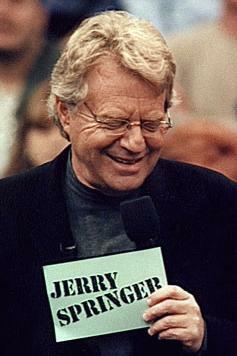 Jerry Springer had to repeat his question, because Pete was staring at a scantily clothed lady who entered the stage with a tray full of dog food. "Come on! ", repeated the host. "When will the doctors fix that tail on your little tail bone?" Pete glanced at Jerry for a moment, but he couldn't help watching the food that the show babe had put on the floor before him. It made his mouth water! The presenter impatiently took up the tray from the ground. He should not have done this! Pete bared his teeth, and let them hear a threatening growl. Jerry shrunk backward, and Pete suddenly flied at his throat. The dog in human shape drove the host away from the stage, while the audience was watching the scene in bewilderment.